Congratulations! 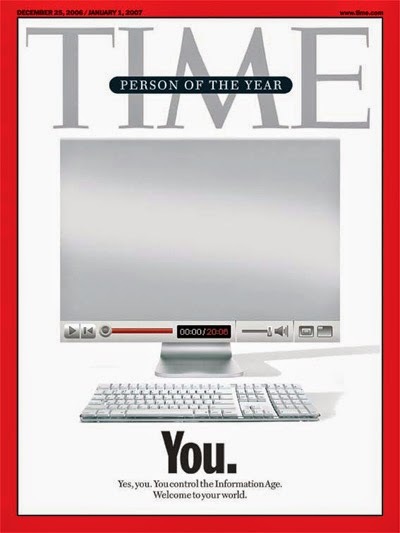 You were chosen as TIME Magazine's person of the year. I hope you appreciate what an honor this is. One of your fellow elect, Kathi, expressed her gratitude by promising to use "all the wealth and fame that came with the recognition for good causes." Sometimes people get chosen for “wealth and fame” as Kathi put it. Other times people get chosen for...something else. Like me for example. A while back, I was chosen to report for Jury Duty. But I’ll tell you more about that experience later. First, read this passage. It is a text about chosen people. As you come to him, the living Stone—rejected by men but chosen by God and precious to him— you also, like living stones, are being built into a spiritual house to be a holy priesthood, offering spiritual sacrifices acceptable to God through Jesus Christ. For in Scripture it says: "See, I lay a stone in Zion, a chosen and precious cornerstone, and the one who trusts in him will never be put to shame." Now to you who believe, this stone is precious. But to those who do not believe, "The stone the builders rejected has become the capstone,"and, "A stone that causes men to stumble and a rock that makes them fall. "They stumble because they disobey the message—which is also what they were destined for. But you are a chosen people, a royal priesthood, a holy nation, God's own people, that you may declare the praises of him who called you out of darkness into his marvelous light. 10Once you were not a people, but now you are the people of God; once you had not received mercy, but now you have received mercy. This text is about chosen people. It is about election. The idea of “election” is almost never discussed without some mention of the theology of John Calvin. According to Calvin, God has unconditionally and specifically elected some individuals, and rejected other individuals. Read my review of Calvin's Gospel of Predestination here. Belief in the Calvin’s view of unconditional election has lead to two dangerous responses: Fear and Complacency. For help with this anxiety, I suggest we look to the theologian Karl Barth. Barth completely reworks his Reformed heritage in his doctrine of election. He asserts that there is only one rejected individual and only one elected individual and that Jesus Christ is both. Barth, I believe, would look at verse four of our text for support when it speaks of Jesus as “rejected by mortals yet chosen and precious in God’s sight.” Jesus is the rejected one. Rejected not only by mortals, but with the sin of the world on his shoulders rejected and forsaken by God. But Jesus is not only the rejected one, but also the elect one, the chosen one. Jesus was the elect because on his shoulders was the whole salvific purpose of God. All the purposes of God’s election of Israel were focused in him. Jesus is the one chosen by God to bring blessing to the whole world. Election, Barth said, is only properly applied to one individual, Jesus. Before and after Jesus, election can only be properly applied to communities. Listen again to our text, starting in vs. 9. Notice that election in both the Old and New Testament texts is not of individuals but of groups: a race, a nation, a priesthood, a people. Election is a communal possession. We are not so much the community of the elect individuals, but the elect community. Our text uses the metaphor of the building built with Christ as the chief cornerstone. Who ever is built on the cornerstone is part of the spiritual house. Whoever believes in the one chosen by God, is part of the chosen community. Our text represents election as primarily communal. We need not fear if we are “elect individuals” we need only to trust that “whoever believes in him will not be put to shame.” As we are a community who trusts in the chief cornerstone, we are the elect community. Here we turn to the second and even more dangerous response to Calvin’s doctrine of unconditional election: COMPLACENCY. Just as fear was a seemingly rational response so is complacency. If you believe you are elect, and that your election is unconditional then it is only a short step to assume that God requires nothing of you. If it is “pure grace” then it must have nothing to do with my actions, we think. Our text speaks to this complacency. We are not merely a Chosen People. We are a People Chosen TO do something. We are a people Chosen TO...proclaim the mighty acts of God. I believe this is the most important truth that this text has for us. Election is purposeful. Presbyterians are often called the “frozen chosen.” And when “frozen” refers to movement in worship, it’s a good description. One of the most painfully awkward things is to attend a Presbyterian church when there is a visiting Gospel choir inviting the congregation to sway or clap with them. But in another sense, to call God’s people the “frozen chosen” is oxymoronic. The community God has chosen, can not be frozen, or inactive, because it is chosen to do something. We are chosen for a task. When God’s people cease to do what they have been chosen to do, they not only deny their own election, but they begin down the road that ultimately ends in the removal of their “chosen” status. Even as Israel was God’s chosen agent through which to bring salvation to the world, so was Jesus...and so were the disciples...and so are we. We are a taste of God’s future for the world. We are evidence of the kingdom and we are the instrument through which God offers salvation in Christ to the world. I told you I would say more about my Jury Duty experience. Actually, it was fascinating. As I walked out of the designated parking lot in Downtown LA. I looked around me at the other people on the sidewalk, many of them had in their hand what I had in mine, the Jury Summons. And we were all walking the same direction. We had been summoned. We had been called. We had been chosen. What I noticed about us as we poured into the courthouse was that we were a veritable cross section of Los Angeles. Men and women of all ages and races. Latino, African American, White, Middle Eastern, Asian. Teen aged girls with black eye shadow and 70 year old men with canes. And we were all being called for a task. The reason we had been chosen was unknown and mysterious, but the purpose for which we had been chosen was obvious: we were chosen to serve...on a jury. We too are chosen to serve. So we must not be complacent. Like Israel who was chosen to publicly worship God for the redemptive Exodus, we too are chosen to proclaim the mighty acts of God who called us out of darkness and into his marvelous light. We are chosen to worship and to witness. Chosen to Praise and to proclaim. Chosen to adore and to announce. We are chosen to be priests, offering sacrifices to God and reconciliation with God to the world. We need not fear: God has chosen us out of pure grace to be his elect community. We dare not be complacent as was Israel. We have not been chosen merely to enjoy God’s benefits, but to announce and distribute them. May our churches live out their identity as the elect, God’s people chosen to participate in bringing salvation and wholeness to the world. We are a chosen race, a royal priesthood, a holy nation, God's own people, in order that you may declare the mighty acts of him who called us out darkness into his marvelous light. So...I guess Romans doesnt mean a thing...“Yet, before the twins were born or had done anything good or bad —in order that God's purpose in election might stand: not by works but by him who calls—she was told ‘The older will serve the younger.' Just as it is written; 'Jacob I loved, but Esau I hated." Thanks for the comment, Roger. I'd love to hear what you think that passage means. I'm not sure it is as self-evident as you assume. How was Jacob loved?